NORTH AUGUSTA, S.C. – Dr. Walter Gamewell Watson, 102, husband of Audrey Bazemore Watson of 67 years, entered into rest on Wednesday, October 24, 2012 at University Hospital. His funeral service will be held at 10:00 AM on Saturday, October 27, 2012 at Grace United Methodist Church with Rev. James D. Dennis, Jr., Dr. John M. Younginer, Dr. Randy Cooper, Rev. Joe Lusk and Rev. John Newell officiating. Interment will follow at Pineview Memorial Park. Dr. Curly Watson was privileged to practice OBGYN 64 years at University Hospital, serving as Chief of Obstetrics for 63 years and delivering over 15, 000 babies. Those of us who were close to him knew that above all, he had a “servant’s heart”. He served his church, his profession, his family, and his community. Doc was a devoted usher and church member at Grace United Methodist Church. Dr. Watson walked the halls of University Hospital sharing kind words, peppermints, and newspapers to staff and patients alike. Papa Doc was a humble man who was a devoted husband, daddy, granddaddy and great granddaddy who led by example. An active supporter of the community, he performed physicals for the football team for over 65 years. Cally’s boys will remember the many milkshake tickets. 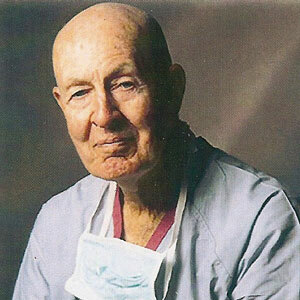 He was a loving family man, a wonderful doctor, and an obedient servant of Christ. Additional survivors include his five children: Donah Watson Cooper (Randy), Ben Gamewell Watson (Joanne), Kathy Watson (Pat), Betsy Watson Corbin (Bryan), and Mary Watson Allen (Tom); grandchildren: Wendy Cooper Wiggins (Terrell), Candice Cooper Herndon, Claire Cooper Jordan (Michael), Randi Cooper Gay (Bill), Kacie Watson Greene, Jamie Watson Young (Kyle), Kyle Watson (Breanne), Patrick Watson (Katie), Matthew Watson (Erin), Wade Watson, Joe Ben Watson, Mac Breazeale, Ben Breazeale (Gina), Meryl Breazeale, Westley Allen and Chris Allen; great grandchildren: Liam Wiggins, McKenna Wiggins, Cooper Herndon, Graham Herndon, Henry Herndon, Noah Jordan, Samuel Jordan, Carolina Jordan, Andrew Gay, Audrey Gay, Lillie Gay, Smith Watson, Edith Watson, Kale Greene, Hank Greene, Beck Greene, Watson Young, Wells Young, Brownley Young, Mason Breazeale, Britton Breazeale, and Cullen Breazeale; one sister, Kathryn Dixon; and one nephew, Walter Dixon. He was preceded in death by one sister, Sallie Lou Watson. Active Pallbearers will be Ned Baynham, Larry Baynham, Dr. Mitch McDonough, Dr. George Williams, Dr. Billy Thurmond, Dr. Randy Smith, Dr. Bill Barfield, and Sammy Anderson. Honorary Pallbearers will be Grace United Methodist Church Ushers, the Etheredge Bible Class, OB-GYN Associates, and Bill Craven. The family will receive friends this evening, Friday, October 26, 2012 at the Wesley Center at Grace United Methodist Church from 4:00 until 7:00 p.m.
Memorials may be made to the W.G. Watson Scholarship Fund at Grace United Methodist Church, 639 Georgia Avenue, North Augusta, SC 29841 or to the W.G. Watson Women’s Center at University Hospital, 1350 Walton Way, Augusta, GA 30901. 3 Responses to "Dr. Walter Gamewell Watson"